Mastoid bone osteoma is a benign tumor of mesenchymal origin which is a rare tumor of head and neck origin with incidence of 0.1-1% of all head and neck benign tumors. ,,, Only 150 cases have been reported in literature in 2010. Patients mostly being asymptomatic present later in the course of disease with a tumor like hard mass located in the postauricular region, which is usually painless and might cause cosmetic disfiguration. Examination of the patient clinically followed by imaging studies remains the mainstay in diagnosis. Surgical resection is the preferred treatment of choice. 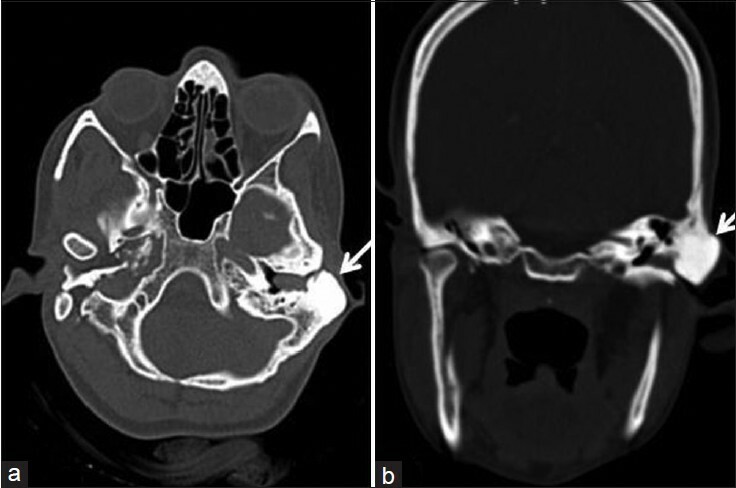 We reported a rare case of mastoid osteoma in a young female causing cosmetic deformity. A young 25-year-old female patient presented to the outpatient department of our hospital with the chief complaints of hard swelling in the postauricular region, which had gradually increased in size over years. The swelling was first noticed by the patient 3-4 years back, which has slowly progressed in size and the patient was asymptomatic but gave an unseemly appearance to the face which was the main concern of the patient. On examination of the patient, a small sized, round to oval, nontender hard swelling with smooth margins was noted behind the ear in the postauricular region, which was of bony consistency measuring approximately 1.5 × 1.5 cm in size with no free mobility suggesting its fixity to the underlying bone. There were no associated inflammatory signs noted over the skin. Past history of the patient revealed no association with trauma, prolonged ear infection, ear discharge, or hearing loss. Otoscopy and audiometry were normal. 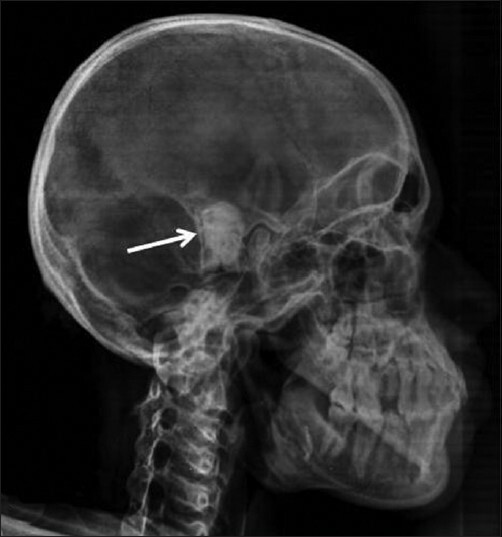 On radiological examination, X-ray skull lateral view showed a well-defined, round to oval dense radiopacity in left mastoid [Figure 1]. On noncontrast computed tomography scan of the temporal bone, a moderate sized, lobulated, and densely calcified lesion of bone attenuation was noted in left mastoid [Figure 2]. The middle ear cavity, ossicular chain, inner table of skull and diploe were normal with no extension intracranially. Above findings were in favor of mastoid osteoma. The osteoma is a benign tumor usually arising from cortex as it is of mesenchymal origin. It shows osteoblastic activity predominantly but also shows osteoclastic activity. Usually, it is diagnosed as an incidental finding on imaging as there are no symptoms associated in most of the cases. If the symptoms are present, the patient complaints of swelling in the postauricular region as in our case. The swelling is usually painless for many years, but can be painful due to the gradual increase in size over the years, also causing cosmetic disfiguration and difficulty in wearing glasses, which are the usual concern of the patient. Rarely, it can involve the petrous part of the temporal bone with involvement of the facial nerve and part of the internal ear that leads to hearing loss as a complication. ,, On radiological examination, the plain radiograph of skull lateral view shows round to oval dense radiopacity with dense calcification noted in the mastoid bone with preserved diploe. , Noncontrast computed tomography is the modality of choice for the diagnosis of mastoid osteoma. On noncontrast computed tomography of the temporal bone with thin sections shows a well-defined round to oval hyperdense lesion of bone attenuation with no intracranial extension. 1. Domínguez Pérez AD, Rodríguez Romero R, Domínguez Durán E, Riquelme Montaño P, Alcántara Bernal R, Monreal Rodríguez C. The mastoid osteoma, an incidental feature? Acta Otorrinolaringol Esp 2011;62:140-3. 2. El Fakiri M, El Bakkouri W, Halimi C, Aït Mansour A, Ayache D. Mastoid osteoma: Report of two cases. Eur Ann Otorhinolaryngol Head Neck Dis 2011;128:266-8. 3. Schartz CW. Cranial osteomas from a roentgenologic viewpoint. Am J Roentgenol 1940;44:188-96. 4. Smud D, Augustin G, Kekez T, Kinda E, Majerovic M, Jelincic Z. Gardner′s syndrome: Genetic testing and colonoscopy are indicated in adolescents and young adults with cranial osteomas: A case report. World J Gastroenterol 2007;13:3900-3. 5. de Chalain T, Tan B. Ivory osteoma of the craniofacial skeleton. J Craniofac Surg 2003;14:729-35. 6. Denia A, Perez F, Canalis RR, Graham MD. Extracanalicular osteomas of the temporal bone. Arch Otolaryngol 1979;105:706-9. 7. Güngör A, Cincik H, Poyrazoglu E, Saglam O, Candan H. Mastoid osteomas: Report of two cases. Otol Neurotol 2004;25:95-7. 8. Kim CW, Oh SJ, Kang JM, Ahn HY. Multiple osteomas in the middle ear. Eur Arch Otorhinolaryngol 2006;263:1151-4. 9. Quesnel AM, Lee DJ. Extensive osteomas of the temporal-parietal-occipital skull. Otol Neurotol 2011;32:e3-4. 10. Izci Y. Management of the large cranial osteoma: Experience with 13 adult patients. Acta Neurochir (Wien) 2005;147:1151-5. 11. Kieffer AS, Long DM, Chou NS, King GA, Cacayorin ED. Tumors of the skull. In: Youmans JR, editor. Neurological Surgery. Philadelphia: WB Saunders; 1990. p. 3599-601. 12. Guérin N, Chauveau E, Julien M, Dumont JM, Merignargues G. Osteoma of the mastoid: Apropos of 2 cases. Rev Laryngol Otol Rhinol (Bord) 1996;117:127-32. 13. Willatt JM, Quaghebeur G. Calvarial masses of infants and children. A radiological approach. Clin Radiol 2004;59:474-86. 14. Pereira CU, Leão JD, Silva AD, Sousa PR, Soares WG, Santos MB. Cranial osteoma. Considerations eight cases. Arq Bras Neurocir 2000;19:170-3.